Clive Staples Lewis (November 29, 1898 – November 22, 1963), known for his writings as C. S. Lewis and by his friends and associates as Jack, was a famous Irish author, novelist, and one of the great spokespersons for Christianity in the twentieth century. As a youth, the untimely death of his mother, the cruelty of his schoolmates and the traumatic events of World War I caused C. S. Lewis to question a God who would allow such horrible things to happen. In 1931, he reconverted to the Christianity of his youth. From that point onward, C. S. Lewis wrote for other people who suffered from the disbelief that had plagued his early life. Whether indirectly through children's novels or directly in apologetic works and radio broadcasts, he spent the latter part of his life helping others come closer to religion, and most especially to Jesus Christ. His writings continue to help people decipher their beliefs, and are today more popular than ever. Clive Staples Lewis was born in Belfast, Ireland on November 29, 1898, to Albert James Lewis and Flora Augusta Hamilton Lewis. His parents were dedicated members of the Church of Ireland and raised Lewis and his elder brother, Warren Hamilton Lewis (Warnie) in that faith. His father worked as a solicitor and his mother was a very promising mathematician. Both parents, but especially Flora, had a great love of books. She taught both of her children to love books and learning, encouraging them to learn Latin and French. The Lewis's extensive library gave Jack the luxury of reading book after book, allowing his imagination to come alive. He often noted that he felt much more comfortable in the various lands of the past described in novels, than he did in the technological world of the 20th century. At a young age Lewis fell in love with the world created by Beatrix Potter and her stories about animals talking and acting as humans. He and his brother, Warnie, would spend hours together creating their own world inhabited and run by animals. They called this world Boxen. Lewis loved to dress up the family pet, Jacksie, from whom he took his nickname. When Lewis was four, his dog was hit by a car and died. After this, Lewis declared to all that his name was now Jacksie and he kept firm to this resolution, not answering to anything else. This name eventually became Jacks, and then finally, Jack. When he was six and Warnie was nine, the family moved to Leeborough or Little Lea, a new house located in Strandtown. C. S. Lewis' happy childhood was unexpectedly disrupted when Jack was just nine years old. His mother passed away from cancer. It was the aftermath of his mother's death that eventually led Lewis to ask questions about the meaning and purpose of life, and led to his rejection of religion. Albert dealt with his loss by sending Lewis to the same boarding school his brother was attending, the Wynyard School in Watford, Hertfordshire. Lewis, who before this time had been educated by his mother and various tutors, left a few months after his mother's death. The pain of her death was accentuated by the cruelty of the school headmaster. Robert "Oldie" Capron, was a man so cruel, so abusive, and so unpredictable that many who knew him believed him to be insane. The school closed in 1911. It was during this difficult time that he found solace and comfort in writing. He wrote about fantasy lands and kind characters, thus escaping from the school through his imagination. Lewis would refer to his time at this school in his autobiographical novel, Surprised By Joy, in which he renamed the school "Belsen" after the World War II concentration camp. C. S. Lewis went on to attend several other scholastic institutions before finally taking charge of his own education. He attended the nearby Campbell College for a few months, until illness made it impossible for him to stay. The educators and doctors felt that Lewis would benefit from time spent in the health-resort town of Malvern, Worcestershire. He enrolled in the prep-school Cherbourg House (which Lewis knew as "Chartres"). It was during this time that Lewis officially denounced his Christian faith. Lewis went on to spend the 1913 school year at Malvern College, until eventually returning home to Belfast and remaining there until 1917. Along with being tutored by William T. Kirkpatrick, the former headmaster of Lurgan College, Lewis attributes his education to the family library. In Surprised by Joy Lewis says, "I am the product of long corridors, empty sunlit rooms, upstairs indoor silences, attics explored in solitude, distant noises of gurgling cisterns and pipes, and the noise of wind under the tiles. Also of endless books. There were books in the study, books in the drawing-room, books in the cloakroom, books in the great bookcase on the landing, books in a bedroom, books piled as high as my shoulder in the cistern attic, books of all kinds reflecting every transient stage of my parents' interests, books readable and unreadable, books suitable for a child and books most empathetically not. Nothing was forbidden me. In the seemingly endless rainy afternoons I took volume after volume from the shelves." During these teenage years, Lewis not only read, but became fascinated with the songs of Richard Wagner and the legends of the North that Wagner described in his operas. The music of Wagner along with the beauties of nature around him gave him an intense longing for what he would later call "joy", and this became a main focal point of study for him. This solitary time at home enabled him to continue writing. He began to explore different mediums, writing epic poetry and trying his hand at writing an opera. Both of these endeavors centered around his love of Norse mythology. He also developed a great love for the Greek literature and mythology while studying with Kirkpatrick (or as Lewis referred to him, "The Great Knock"). With Kirkpatrick's sharp skills, Lewis became adept in debate and clear, focused reasoning. With all of these many facets of education under his belt, Lewis was the recipient of a scholarship from University College, Oxford in 1916. which coincided with the events of World War I. Lewis did not immediately begin college, but instead enlisted with the British Army in 1917, where he was commissioned as an officer in the Third Battalion, Somerset Light Infantry. During his training, Lewis made an acquaintance that would change his life. Edward Francis Courtenay "Paddy" Moore was Lewis's roommate during the training period and became friends with Lewis. Paddy introduced Lewis to his mother, Jane King Moore, who took him under her wing and treated him like a son. At nineteen, Lewis was sent to the front line of the Somme Valley in France, and on April 15, 1917, he suffered an injury during the Battle of Arras. In addition to his physical injury, Lewis found himself battling depression and a severe case of homesickness. While in the hospital he found himself visited by Paddy Moore's mother, Jane. A lasting friendship formed and Lewis took to her kindness immediately, which is not surprising given that his father refused to visit him in the hospital. Lewis made a promise to Paddy, that should Paddy die, then he would care for Jane and see to her needs. By October of the same year, Lewis had made a full recovery from his wounds, but his experiences of war and battle were never forgotten. Paddy Moore did die in battle and Lewis kept his promise, often referring to Jane as his mother. As Jane aged and grew senile, the relationship became difficult, but Lewis kept his promise, visiting her nearly everyday when she was put in a nursing home. In December of 1918, he returned home with an honorable discharge and returned to his studies. In the next few years C. S. Lewis distinguished himself by receiving several different awards including: a First in Honor Moderations (Greek and Latin Literature) in 1920, a First in Greats (Philosophy and Ancient History) in 1922, and a First in English in 1923. These years also marked the time when Lewis moved in with Jane Moore, even though he also kept rooms at his college. In December 1917, Lewis wrote, in a letter to his childhood friend, Arthur Greeves, that Jane and Greeves were "the two people who matter most to me in the world." Finally in 1930, Lewis and his brother Warnie moved into "The Kilns", a large house with a wardrobe that is depicted in the Chronicles of Narnia. The house is located in Risinghurst, Headington (a suburb of Oxford). The gentlemen took an aged Jane to live with them, and all three contributed to the purchase of the house. Upon Warren's death in 1973, the house passed to Jane Moore's daughter, "Lady Dunbar of Hempriggs. Plaque on a park-bench in Bangor, County Down. C. S. Lewis' Irish heritage led him to write of England, "No Englishman will be able to understand my first impressions of England," he wrote in Surprised by Joy. "The strange English accents with which I was surrounded seemed like the voices of demons. But what was worst was the English landscape... I have made up the quarrel since; but at that moment I conceived a hatred for England which took many years to heal." Lewis's patriotism for Ireland was strong and heartfelt. He associated himself with the land, the people, and the history of his country. From a young age Lewis had studied Irish mythology in depth, along with the great Irish authors and he was intrigued with learning the unique Irish language. During his studies, Lewis came to admire deeply the writings of fellow Irishman, W.B. Yeats. He loved Yeats's details and vivid use of Ireland's Celtic heritage in his poems. In a letter to a friend Lewis wrote, "I have here discovered an author exactly after my own heart, whom I am sure you would delight in, W. B. Yeats. He writes plays and poems of rare spirit and beauty about our old Irish mythology." When he found his English associates indifferent to Yeats, he was shocked, and unable to account for it. In describing his time at Oxford he wrote: "I am often surprised to find how utterly ignored Yeats is among the men I have met: perhaps his appeal is purely Irish—if so, then thank the gods that I am Irish." Lewis was unable to return to Ireland because of his work at Oxford, and he regretted this circumstance, but he paid regular visits to the country of his birth. At the beginning of his writing career, Lewis had intended on sending his works to a major Dublin publisher. In a letter to a friend he wrote: "If I do ever send my stuff to a publisher, I think I shall try Maunsel, those Dublin people, and so tack myself definitely onto the Irish school." Lewis was often known for his tongue-in-cheek chauvinism toward the English. Describing an encounter with a fellow Irishman he wrote: "Like all Irish people who meet in England we ended by criticisms of the inevitable flippancy and dullness of the Anglo-Saxon race. After all, ami, there is no doubt that the Irish are the only people... I would not gladly live or die among another folk." Throughout his life, C. S. Lewis often sought out other Irish living in England and kept close friendships with many of them. He referred to this as "my Irish life". 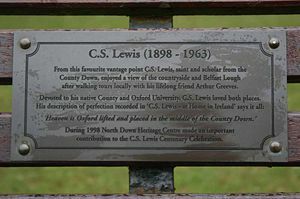 Lewis's friend Owen Barfield said that C. S. Lewis could be broken down into three very different and distinct C. S. Lewises—the first was the role he played as a distinguished Oxford scholar and teacher, the second as a popular author of science fiction and children's novels, and the third as a highly religious spokesman and writer of Christian apologetics. C. S. Lewis served as a teaching fellow from Magdalen College, Oxford from 1925-1954. His career as a professor and intellect would prove to be satisfying, prestigious, and prolific. After his tenure at Magdalen, he worked at the University of Cambridge and Magdalene College, Cambridge. He became the first Professor of Medieval and Renaissance English at Cambridge University. These classes, and his particular interest in the subject, led to one of his first works, The Allegory of Love (1936), which concentrated on the later Middle Ages and the use of allegory during that time period. Lewis was then commissioned to write important prefaces to old works of literature and poetry, among them were Layamon's Brut and John Milton's Paradise Lost. His last academic work was published in 1964, The Discarded Image, an Introduction to Medieval and Renaissance Literature. "When I began teaching for the English Faculty, I made two other friends, both Christians (these queer people seemed now to pop up on every side) who were later to give me much help in getting over the last stile. They were H. V. V. Dyson and J. R. R. Tolkien. Friendship with the latter marked the breakdown of two old prejudices. At my first coming into the world I had been (implicitly) warned never to trust a Papist, and at my first coming into the English Faculty (explicitly) never to trust a philologist. Tolkien was both." C. S. Lewis is probably best known as a writer of fiction. Lewis wrote several popular novels for young adults and children. His two most popular series remain the Space Trilogy (science fiction) and his series, The Chronicles of Narnia (fantasy). Lewis grew up with a pessimistic view of the world conditions he witnessed. The Space Trilogy or "Ransom Trilogy" novels address the dehumanizing trends that Lewis and his fellow scholars witnessed in modern science fiction. Lewis wrote the first book, Out of the Silent Planet, following an intense conversation with his friend Tolkien about these trends. The two agreed to a sort of pact, Lewis would write a "space travel" story and Tolkien a "time travel" one. Tolkien’s story, The Lost Road, was a tale that dealt with his famous Middle-earth mythology and the modern world, though it was never completed. Lewis did finish his story and based the main character, Ransom, on Tolkien. Another character, Jules, from That Hideous Strength, was inspired by the works of H. G. Wells. There are seven individual novels that comprise The Chronicles of Narnia. These books remain the pinnacle of Lewis's career as a fiction writer. The books reflect Lewis's Christian values and portray many Christian themes including The Fall, The Atonement, and The Resurrection. The novels depict the adventures of a group of children who find themselves in a magical and mystical land called Narnia. The books were published between 1950 and 1956, beginning with The Lion, the Witch and the Wardrobe, the most popular book of the series, which has now been adapted for both stage and screen. The novels clearly reflect Lewis's love and knowledge of Greek mythology, Roman mythology, Celtic mythology and traditional English and Irish fairytales. Lewis was author to several other stories, among which are The Screwtape Letters, a story about the temptation of man by the devil. Till We Have Faces is a retelling of the Cupid and Psyche myth. Lewis believed that this was one of his most masterful works, but the novel never gained much recognition. Not only was C. S. Lewis a scholar and a novelist, he also became widely known for his Christian apologetics. Mere Christianity remains his most popular book on the subject. Having struggled deeply with religion, Lewis became an atheist in his youth and remained so until his conversion to Christianity in 1931. Because of his struggles with religion, Lewis desired to present the concept of Christianity with as much reason and logic as possible. His books Mere Christianity, The Problem of Pain and Miracles sought to address all the popular objections to Christianity. His career went beyond the pen as he became a lecturer and broadcaster, reading many of his writings for a radio audience. In his autobiographical novel, Surprised by Joy, Lewis said that "I'm very angry with God for not existing". But the influence of his friends, especially Tolkien and his wife Joy Greshim, led Lewis to see Christianity with new eyes. "You must picture me alone in that room in Magdalen, night after night, feeling, whenever my mind lifted even for a second from my work, the steady, unrelenting approach of Him whom I so earnestly desired not to meet. That which I greatly feared had at last come upon me. In the Trinity Term of 1929, I gave in, and admitted that God was God, and knelt and prayed: perhaps, that night, the most dejected and reluctant convert in all England." In 1931, after a lengthy discussion with Tolkien and another close friend, Hugo Dyson, Lewis could not deny what he knew to be true and he reconverted to Christianity, becoming a member of the Church of England. He noted, "I came into Christianity kicking and screaming." He is now popularly known as The Apostle to the Skeptics because he approached religion with a skeptics view, and still found conversion and conviction. He addresses many of his skeptical positions in The Problem of Pain. Lewis was not without his critics and Evangelical Christians especially took exception to some of the things he professed. The fact that he smoked and drank and lived in a house with an unmarried woman 25 years older than him (even after he converted to Christianity) also did not sit well with some. His fiction books were criticized for being vaguely and inaccurately based on biblical themes that were mixed with paganism. He claimed that followers of pagan religions can be saved without personal faith in Jesus Christ. He wrote in Mere Christianity, “But the truth is God has not told us what His arrangements about the other people are33There are people in other religions who are being led by God’s secret influence to concentrate on those parts of their religion which are in agreement with Christianity, and who thus belong to Christ without knowing it." Lewis was clearly ecumenical in his approach to Christianity. He submitted parts of Mere Christianity to four clergymen for criticism—an Anglican, a Methodist, a Presbyterian, and a Roman Catholic. He wrote of his hope that all Christians 'ought to be reunited.’ He was also clear that he did not intend his writings to be seen as an alternative to the creeds of existing denominations. In April of 1956, C. S. Lewis, a 57-year-old dedicated bachelor, married Joy Davidman, an American poet with two young children. Lewis and Davidman enjoyed four years of blissful marriage and were intensely happy together. Joy died of cancer in 1960, at the age of 45. Her death shattered Lewis, and his pilgrimage through the process of bereavement resulted in his writing A Grief Observed. Lewis died on November 22, 1963, exactly one week before his 65th birthday, at the Oxford home he shared with his brother, Warren. He was buried in the Headington Quarry Churchyard, Oxford. His death coincided with the assassination of President John F. Kennedy, and the author Aldous Huxley, which all occurred on the same day. Thus, for much of the world, Lewis passed away quietly. 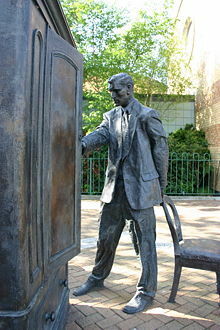 His works live on and a bronze statue of Lewis looking into a wardrobe, erected in Belfast's Hollywood Arches, remind the world of his legacy. C. S. Lewis left behind a long legacy of influence. He remains the inspiration of several books including, A Severe Mercy by Sheldon Vanauken, along with works inspired in part by The Chronicles Of Narnia, including A Series of Unfortunate Events by Daniel Handler, Eoin Colfer's Artemis Fowl series, Philip Pullman's His Dark Materials trilogy, and J. K. Rowling's Harry Potter. His later life was also made into a major motion picture, Shadowlands, starring Sir Anthony Hopkins. During his lifetime, Lewis was against his novels being turned into films because of the technology at the time. He was worried that all of his creations, especially the animal characters, could only come off looking like "buffoonery or nightmare". Thus no films were attempted during his career. Lewis continues to be an inspiration even in pop-culture as the song "The Earth Will Shake" performed by Thrice is based on one of his poems, and the band Sixpence None the Richer are named after a quote they took from Mere Christianity. Works by C. S. Lewis. Project Gutenberg. Into the Wardrobe — a Web site devoted to C. S. Lewis. NarniaFans.com — C. S. Lewis news, database, and community. NarniaWeb.com — Narnia & C. S. Lewis news, resources, forum. C. S. Lewis Chronicles — a compendium of information about Lewis. C. S. Lewis Classics — a website by HarperCollins Publishers. History of "C. S. Lewis"
This page was last modified on 22 December 2016, at 16:35.